Whoa! We reached 300,000 classifications today! I saw the classification number creep up there earlier this week but didn’t get a chance to write a blog post about pushing the classifications up to 300,000. But YOU DID IT! Who are the folks who made 300,000 classifications? 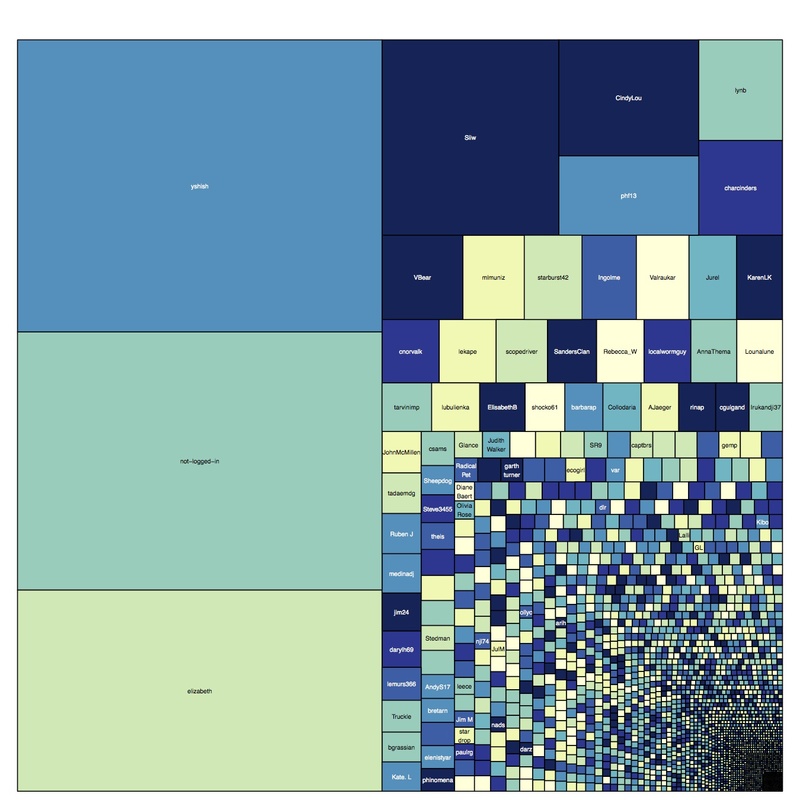 To explain this we made a treemap to show the number of classifications that each person has made. We borrowed this idea from Margaret Kosmala of Snapshot Serengeti and Philip Brohan of Old Weather, who have created similar graphics for their projects. In this graphic, each box represents one user, except for the users who were not logged in (those were all grouped together). We have over 2600 registered users on this site! And the size of the box reflects the number of classifications. Can you find yourself in this graphic? What you’ll see here is that unlike some other projects (e.g. Snapshot Serengeti), our top 2-3 classifiers have done many more classifications than all the non-logged-in users combined! It’s interesting to us — because while Plankton might not have a very broad appeal to the general public, there are some people — YOU — who love this project so much that they dedicate a lot of time to it. You help carry this project along, and in the process, you become our ambassadors to your schools, communities, and cities. It’s quite amazing. Our next 10 top classifiers are: Ingolme, Valraukar, Jurel, KarenLK, cnorvalk, lekape, scopedriver, SandersClan, Rebecca_W, and localwormguy. Those whose names are marked with an asterisk (*) also help moderate the discussion boards – give a round of applause to them! We hope that you all have enjoyed your time on this site – we have certainly enjoyed interacting with all of you on the discussion boards! It’s been very fun getting people all around the world involved in this project. Here’s to 300,000 more! P.S. Also a huge congratulations to Zooniverse for being awarded a $1.8 million Google Global Impacts Award! This entry was posted in Citizen Science and tagged Citizen Science, classification, thank you, treemap, Zooniverse by jessicaluo. Bookmark the permalink. awesome! :) I really love this project! ok:).. and what about the french version, has it brought more users to the Plankton portal? There’s definitely some!! The French guys are also working on their own promo. I think they’re going to get it into the Monaco Aquarium!! Really interesting to see the different patterns of participation across the different project. Congrats on reaching 300,000 classifications! Hurrah! Let there be 300,000 more and beyond! Seriously, I think it’s just an awesome project (which is probably why I keep trying to nag everyone I know into going and checking it out) and – let’s face it – there’s no stopping us now! I couldn’t find myself on the picture, which means that I have a lot of work to do 🙂 Great to see so much interest and participation in the project! That’s not true! You’re helping with important scientific research. These jellyfish are really abundant and yet we know next to nothing about them. In the context of a changing global ocean, the more we know about current conditions and the animals that live in the ocean, the more we will know how to manage when the environment starts changing. …and precisely ONE short of being in the top twenty. Ugh! I really wanted that solmarisnuggle. Well, I clearly need LESS of a life. I really like that, “solmarisnuggle.” I might have to borrow that term from you sometime! I was amazed I was mentioned and could find my name in the tree! A suggestion–if it’s not too much trouble, could you update the tree each week or so, to encourage us to classify more? That’s a great idea! I will make one for the last few weeks. hi. i’m sorry to hear that, but no such problems on my side.